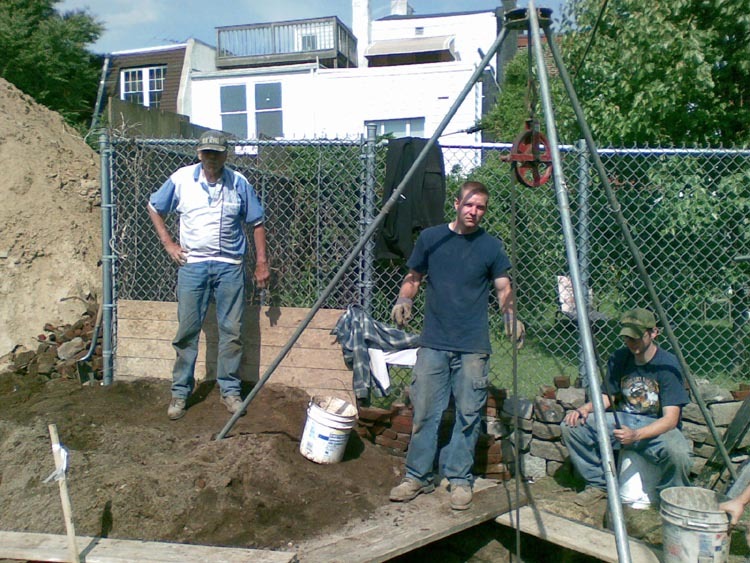 After a failed day in Baltimore on Saturday I got a call from Matt about a construction site in south Philadelphia. 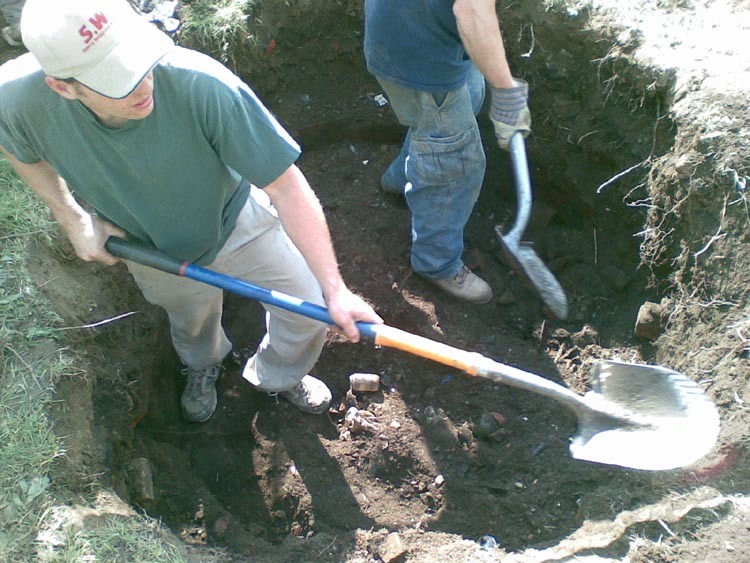 Matt told me that him and George had checked out the site and didn't see anything to dig the soil looked very sterile. Matt told me the location of the site and I quickly checked out the maps and called Matt back and said I think there should be a pit on the site. He told me that a friend of Georges had permission on the site but wasn't worried about it because he also felt there was nothing on the site. 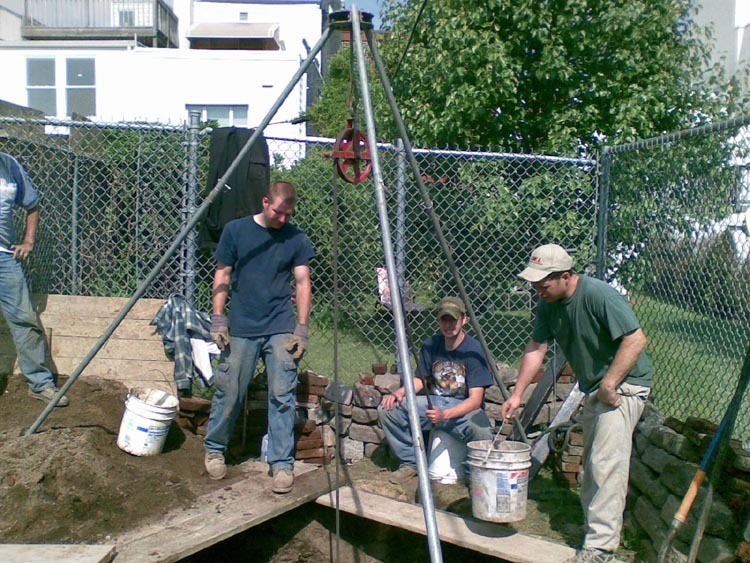 So I called George and asked him about the site George said his friend Greg had permission and Said he could go on the site and dig if he wanted. So I asked George if it would be ok if Doug and I could go mess around on the site Monday. I told him I'm sure there will be at least one pit on the site. George said he would call me back. About an hour later I got a call from George and he said that Him and Russ were going to dig Monday and that they would meet us there at 7:00 in the morning. Doug and I were the first to arrive promptly at 7 and in about 3 minutes I spotted an 18th century wood liner in the wall of the excavated pit. 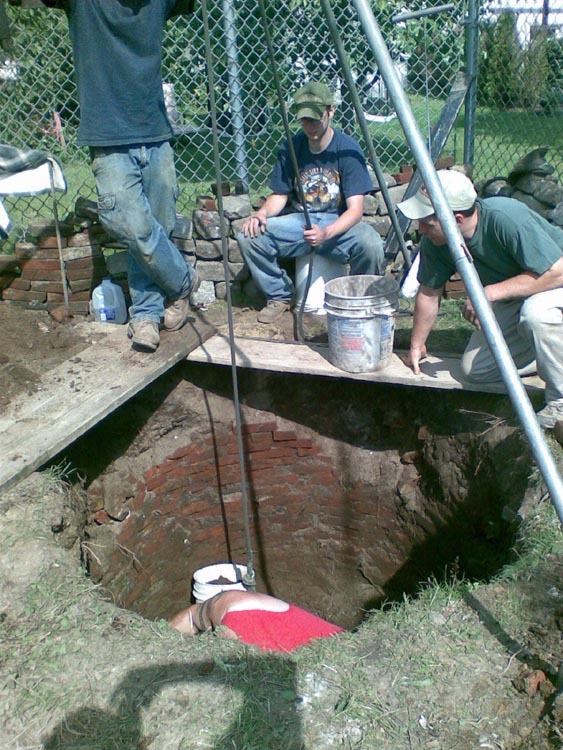 Doug and I started scratching out Rev war era ceramics and glass shards for the bottom couple feet of this pit. about 15 minutes later Russ arrived and he told us that his friend Ken was coming to dig also and he would be there in about a half hour. Doug, Russ, and myself finished up the woodliner and sifted the use layer about the time George showed up. He brought Matt with him so now we had 6 diggers on site. I climbed up out of the large excavated pit and probed where I thought there should be a brickliner. I was right one the probe sank right in. 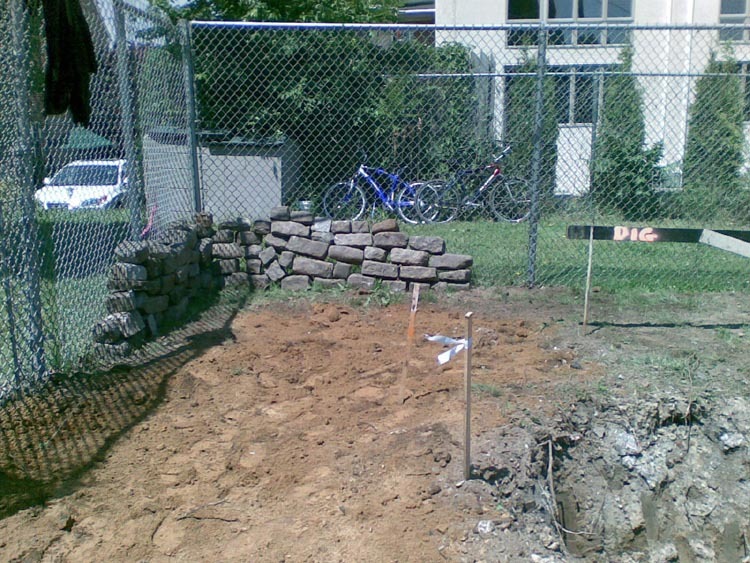 So the gang started opening up this large Brickliner that would have been shared by 4 small houses. It was about 6 feet across and we got down about 8 feet and started hitting 1860s shards coming up the sides. 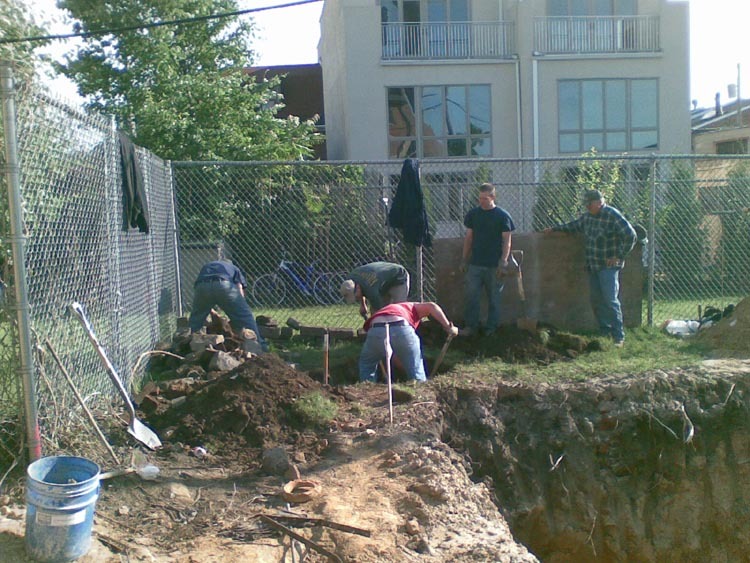 Privies in this part of Philly are often over 20 feet deep so we were very excited that we could have an undiped pit with a huge use layer. 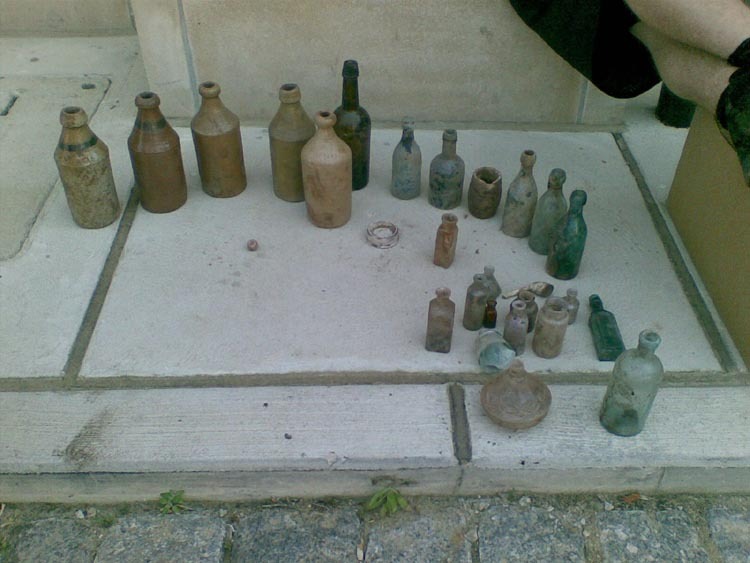 Soon we had the whole layer exposed and several 1860s impressed local stoneware bottles were found then a pontiled Brown stout porter several 1860s smooth based sodas and a very nice hand painted marble. But the bottom showed its ugly head. This was a very shallow pit being only 10 feet deep. but it did produce some nice finds for everyone.